Happy New Year everyone! A little late in the year for greetings maybe but this is my first post of the year! Today I’m going to share with you a recently translated Japanese Sewing Book called Casual Sweet Clothes – Favourite Pieces for Every Day. Luckily for me, the very kind folks at Laurence King sent me a copy for review, and so I’m here to share with you the lovely pieces from the book! The patterns in this book are designed by Noriko Sasahara, who is a Fashion Design graduate of Bunka Fashion College. There are 18 patterns in all, Labelled A-R. The contents page is arranged by the order of appearance in the book, in some cases you will see the same garments featured again as co-ordinates paired together to form a complete outfit. Just to give you an idea of how to put the whole wardrobe together. Now let’s have a look at the pretty pieces! A- Dress with Ruffle Shoulder Detail. A simple shift made feminine by the light ruffles running along the shoulder seams. This dress pictured is made in light cotton chambray. A combination of 2 patterns. C- Jersey top with cape sleeves (seen here in cotton and linen jersey knit) and P – a Layered lace skirt. Not my favourite way of paring them together. I would love to see the Jersey top with a pair of jeans and the lace skirt with a simple strappy camisole? D – Jewel-neck Jacket with Bow. When I read this, I was wondering “what is a Jewel-neck?” Then I found the answer on Google. Apparently it’s a round neckline, quite similar to the boat neck but just falls above the collarbone. It’s so named because the cut helps to accentuate or showcase a piece of jewellery against the fabric. I learned something new today! E – Another very sweet and feminine piece, a Lace-trimmed camisole. The ribbon belt is not an add on, but actually part of the design. The ribbon goes through a casing at the back of the camisole, and helps to gather the fabric in the back when you pull it together and tie it up in the front. F – Casual pants with ribbon belt (with 2 side pockets). It’s hard to see from the picture but there is also a grosgrain ribbon binding the edge of the side pockets and running down along the side seams. Fabric used for the pants is Water-repellent cotton garbadine. G – Lace-front blouse. If you are not keen on adding the lace panels, you can omit them, as the blouse itself is a very pretty blouse pattern with gathers both around the shoulder seams as well as the cuffs. I can imagine this pattern as a starter block for lots of pretty blouses, or even a coat. H- V-neck shift with double ruffled cuffs. A very easy to wear dress that makes you look slim yet can hide your flaws since it’s not skin-tight. I love the double ruffles on the cuffs. The back of the dress is enclosed with a zipper, and as part of the design it is an exposed zip (in black). I’m not sure if exposed zips are still in vogue but you can decide for yourself if you want to attach it inside or out. It’s good to learn how to sew an exposed zip though, since fashion trends are cyclical and you never know when it will make a comeback. I – Bolero Vest with Braid Trim, paired with the Casual pants (pattern F) seen earlier. I love the bolero vest with the contrast braid trim! The position of the braid trim is marked out on the pattern sheets to guide you on its placement. J – Tiered Pencil Skirt. I can never pull off skirts of this length, but still, can’t help but marvel at how pretty it is. The skirt above is made in cotton sateen which has a bit of sheen, and there are 6 layers of overlapping ruffles. Here you see the same skirt paired with a flared jacket with raglan sleeves. I can’t quite imagine the two being paired together like this, but I just wanted to show you the pattern for the jacket. It’s a very simple casual jacket with a hood and two external pockets. Both the sleeves and bodice are flared. This will be a useful pattern for a rainy day jacket. K – Dress with lace-insert sleeves. Another very pretty shift dress with gathers along the shoulder seams of the front bodice. The sleeves are made of separate front and back pieces so that you can sew a piece of lace in between for a little peekaboo effect. The back is enclosed using a concealed zipper. I can see this in a shorter blouse version as well, or a different fabric for a less formal look. N – Denim Jacket with Braided Detail. The braided detail is made using 3 strips of denim and sewn all around the front and collar. There are no buttons on the front of the jacket though. The braided denim is attached using a blindstitch according to the instructions. By that I suppose it means you have to hand sew it? O – Flounced-edge jacket. A short cropped jacket with a pretty flounced edge that goes all around the edges. The main jacket body itself is made of 2 front pieces, one back piece and 2 side pieces. The sleeves are also made of two parts each, a top sleeve and an under sleeve. The extra seams help with the shaping of the jacket and gives it a more structured look. R – Round-neck coat with turn-up cuffs. This is actually from a similar pattern to pattern N – the denim braided jacket, but with a round collar and this coat is longer, almost to knee length. The cuffs can be worn folded down or up. Now for some technical details…. The sizes in this book include XS-L, and will fit the following body measurements. Note that the measurements are in inches, with their cm equivalents indicated in brackets. A typical layout of the how-to-make page. Do also note that the seam allowances are not included in the pattern sheets, but have to be added on as indicated on the cutting layout diagram (bottom right diagram). Where it is not stipulated, use 1cm for seam allowance. In one corner of the page, note that there is a Finished Measurements table. 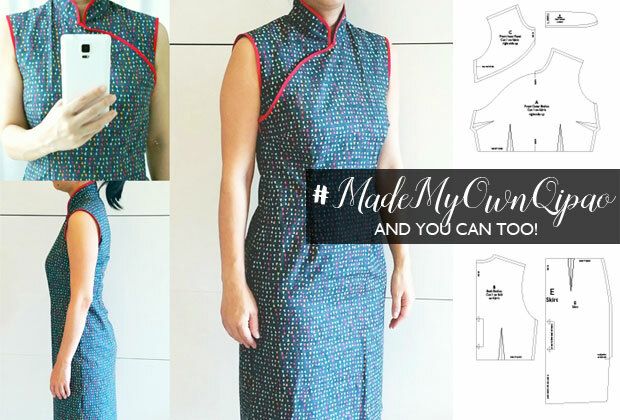 This gives you an idea of the size of the finished garment so that you can select the right size or choose whether or not to make length adjustments before cutting out your fabric. A close up of the diagrams included. There are 2 pages on the back teaching you how to adjust the dress and sleeve lengths properly. The patterns are stored in a plastic pocket attached to the back cover. There are two full size pattern sheets, printed on both sides. I really love the pieces in this book, especially the fact that they are mostly easy to wear and can be made casual or formal depending on the fabric choice. There are many books that have simple shift dresses but tend to look shapeless or baggy. Not in this book. The subtle accents like gathers around shoulder seams, added ruffles or lace panels really ups the style factor. I hope you liked this book as much as I did! I will be back next week with another soon to be released English book review. This time for girls, so stay tuned! Some pretty stuff in here. That lace blouse is great! Thanks again for doing such in-depth reviews on these books for us! Thanks for the review I love being able to see everything before I go to buy the book, usually amazon and cd. doesn’t show you a lot if any pages.